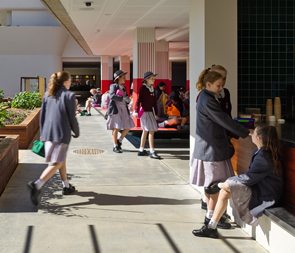 Members of the Mount Alvernia Community are allocated to one of six houses. Each house is named after a significant place in the life of Saint Francis or Elizabeth Hayes, founder of the Missionary Franciscan Sisters of the Immaculate Conception, under whose auspices the College was established. Belle Prairie is the place where Elizabeth Hayes founded the community of the Missionary Franciscan Sisters of the Immaculate Conception in 1873. The house crest represents the log cabin in Belle Prairie where Elizabeth Hayes established her first mission. It was here, in this one-roomed cabin, that Elizabeth Hayes began the true missionary life she had envisaged. Mother Mary Ignatius of Jesus (Elizabeth Hayes) and the Sisters were consumed with the desire to help others whenever they saw the need. Starting schools for under-privileged girls and other ministries, Elizabeth Hayes continued to say, “Nunc coepi” – “let us begin”. The house crest represents the log cabin where Elizabeth Hayes established her first mission. A popular flower commonly found in the prairie lands of the west and southwest of Minnesota is the Prairie Phlox. The purple loosestrife also used to grow near the Mississippi River, where the log cabin that Elizabeth Hayes opened her mission in was located. The colour purple, therefore, relates to the flora in Minnesota and Belle Prairie. 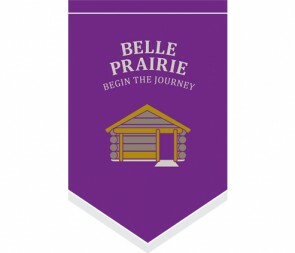 The spirit statement of Belle Prairie house – Begin the Journey – inspires the whole house. It calls all members to begin embracing those underprivileged in our community and begin living in the Franciscan way by being confident, strong and daring young women. Greccio is the place where, in 1223, Francis re-enacted the scene of the birth of Jesus in the cave of Bethlehem. Francis said to John Velita, a gentleman of Greccio, that, “I would like to celebrate the next feast of the Redeemer with you, I would like to recall his birth in Bethlehem in order to see all the poverty that he endured from his birth to save us sinners” (1Cel.468-471). Francis called his companions, the poor and the rich, and all creatures to share his joy in the celebration of Christ’s birth and his wish was granted beyond all expectations. For Franciscans, the celebration at Greccio renews the wonder of Jesus’ birth in Bethlehem and reminds us of our obligation to be his joy and peace in our world. The house crest depicts the stable where Jesus was born. The infant is shown wrapped in swaddling clothes and lying in a manger. The star that guided visitors to his birthplace is shown, shining down. Greccio’s house colour is yellow and it reflects the torches of those who celebrated that nativity re-enactment by turning the dark chill of the night into the brighter, warmer light of day. It represents the light of Christ in the world. 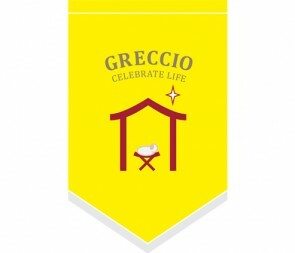 The spirit statement of Greccio house – Celebrate Life – affirms the central theme of traditional Christianity and deeply held conviction of Francis that God so loved the world that he sent his Son, Jesus, to become part of it. People in this house will appreciate the world and engage with the opportunities life offers. Perugia was the city near Assisi where Francis was confined from 1202 to 1203 after being taken prisoner at the battle of Collestrada. He suffered much during his confinement, but continued to remain cheerful. Francis was ransomed by his father and he returned to Assisi a changed person. He began to seek out quiet places to pray in search for the will of God in his life. This time of imprisonment triggered the first step in his conversion experience. It was, for him, the opportunity to consider the world and his place in it. The house crest shows the bars of Francis’s prison with the light beyond them shining over the green fields. Paradoxically, it was during his confinement that he was able to explore his life and make meaning of it – from the constraints of imprisonment came the richness of certainty. The house colour is green. It reflects the green pastures seen from Francis’s prison walls and represents the nurturing and growth that occurred in Francis’s life. 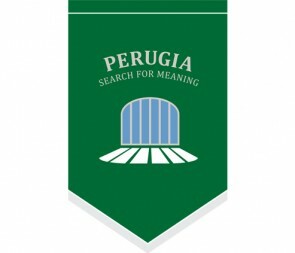 The spirit statement of Perugia house – Search for Meaning – affirms for members of this house their responsibility to seek quietness from time to time in order to consider their place in the world and to make sense of all that comes their way. The Rieti Valley is considered one of the most important areas of Italy for Franciscans. It was in this place that Francis and his first companions started out on their journey, united by absolute poverty, solitude, simplicity of heart, and a great love of God and creation. It is rich in Franciscan history. The four special sanctuaries in the Rieti Valley are Poggio Bustone, Fontecolombo, Greccio and La Foresta. It was at Poggio Bustone that Francis first used the famous greeting, “Good morning, good people!” In 1223 Francis withdrew to Fontecolombo to write his final Rule. It is this rule of a Gospel way of life that all Franciscans follow today. Here, also, Francis marked the space at the side of the chapel window with the Tau. This T-shaped symbol became his signature, was a biblical sign of redemption, and often identifies Franciscans worldwide. 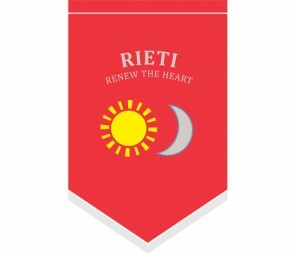 The Rieti house crest displays symbols of the sun and moon, which remind us of the words from the Canticle of the Creatures. It is believed that Francis wrote some of the verses at La Foresta in 1225 when he came here to rest and regain his strength after receiving the Stigmata on La Verna. The house colour is red and represents the strength and warmth of the fervour of Francis’s love for God and creation. The spirit statement of Rieti house – Renew the Heart – calls the members of this house to be aware of their need to strengthen themselves with prayer and solitude. By doing this they are able to commit more fully to Christ’s call to go out into the world as Franciscans who work for peace, justice and integrity of all creation. Spoleto Valley is the beautiful area where the home of Francis – Assisi – is situated. It was surely here that Francis fell in love with creation and, in time, with the God of Creation. In 1205, three years after his release from imprisonment in Perugia, Francis prepared himself once more to go into battle, this time with the Crusaders. He set off riding through the Spoleto Valley and, as he lay sleeping, a question was put to Francis that changed his life. He heard a voice ask: “Whom do you want to serve, the lord or the servant?” Francis, understanding that it was God speaking to him, answered that he wanted to serve the Lord. The voice instructed Francis to stop his journey, saying, “Go back to the place of your birth, for through me your vision will have a spiritual fulfilment”. The consequences of his answer changed his life forever. 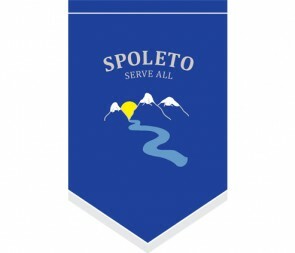 The Spoleto crest shows the landscape of hills, valleys and rivers of this region – the reflection of creation that was the source of Francis’s great love of God, the world and all its creatures. The house colour is blue and it reflects the colour of the clear skies above the Spoleto Valley and the beautiful river running through it. The spirit statement of Spoleto house – Serve All – affirms Francis’s commitment to all of creation. Members of this house must follow his example of service to everyone. Villa Spada was a significant place in the life of Elizabeth Hayes and the Missionary Franciscan Sisters of the Immaculate Conception. It was from this ‘mother house’ that the sisters made their way to the missions around the globe. Villa Spada is significant also as the place where, on 6 May 1894, Elizabeth – also known as Mother Mary Ignatius of Jesus – died, supported by her sisters. A commemorative plaque has been put in the chapel there, in memory of her death. The crest of the house is inspired by the design on the front of the chapel altar. This chapel is still maintained in Villa Spada in memory of Elizabeth Hayes. Orange is the colour of this house because of its connection to the Roman environment where sunsets exude a golden orange glow, conveying warmth and deeply rooted energy. Orange is also the colour of harvest and represents the bountiful productivity of the ‘mother house’ of the Missionary Franciscan Sisters of the Immaculate Conception. Orange conveys, enthusiasm, determination and success – all clearly evident in the international religious order begun by Elizabeth Hayes. 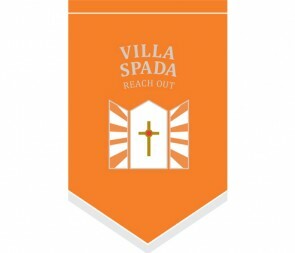 The spirit statement of Villa Spada house – Reach Out – embodies the core of Elizabeth Hayes’ missionary ideals. Members of this house are called to recognise God’s call to reach out to those in need across the world and to contribute to the missionary work needed to give all people dignity and respect. One of Saint Francis of Assisi’s well known stories is his taming of the Wolf of Gubbio (Italy). 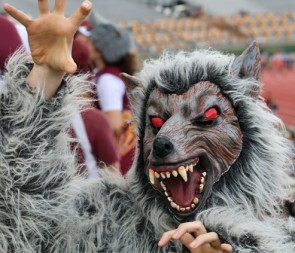 Before Francis’s arrival in Gubbio, the wolf had been responsible for devouring or harassing many of the village people. Through Francis’s love for all God’s creatures he was able to bring the villagers of Gubbio into a peaceful relationship with the wolf. The villagers provided food to the starving wolf, and these actions led the wolf to become a part of the Gubbio community. This story is the motivation behind the college mascot. While fierce in appearance, Gubbio is a symbol of the interaction we have with community, the environment and in service to others.